Life in L.A. is like a game of Chutes and Ladders. If one day you’re down, the next you’re likely to be up. In a town where you can go from Production Assistant to Associate Producer overnight, it’s no wonder starry-eyed dreams persist in this city. A visual metaphor for this phenomenon can be found in the hills, where short cuts to commanding views abound. You just have to know where to find them and be willing to pump those legs a little. Before the intricate network of the freeways took shape and became the lifeblood of L.A., city planners created an elaborate system of stairways, which allowed the residents of our hillside communities access to trolleys, supermarkets and schools. Today, the trolleys are gone, but the stairs remain, some hidden between residences, decorated with stencils, even graced with secret enigmatic messages. 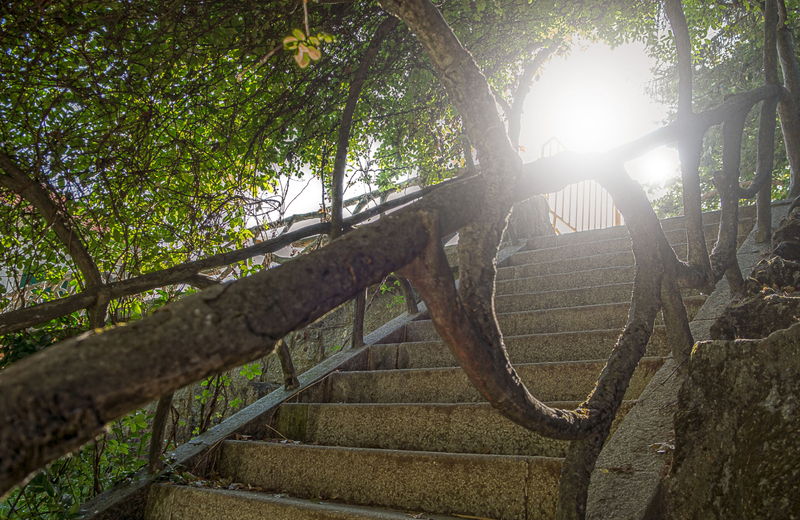 Laurel and Hardy’s famous music box steps in Silver Lake are some of the most popular of the Secret Stairs. Local walking tours stop here for a hike to the top and a gander at the plaque commemorating this landmark of film history. From Griffith Park Blvd., head up Scotland and you’ll find a set that climbs to Panorama. There’s another down at Silverado that rewards you with a great view of downtown, and overlooking the reservoir, one block from the steepest grade street in California (sorry, SF) you’ll find the Cove Ave. stairs offering a pretty sweet view of what residents along the reservoir enjoy every day. There’s a website devoted to mapping the hidden stairs as well as a book that explains their history and provides a walking guide. So keep climbing in L.A. The view from the top is breathtaking. "No one belongs here more than you."